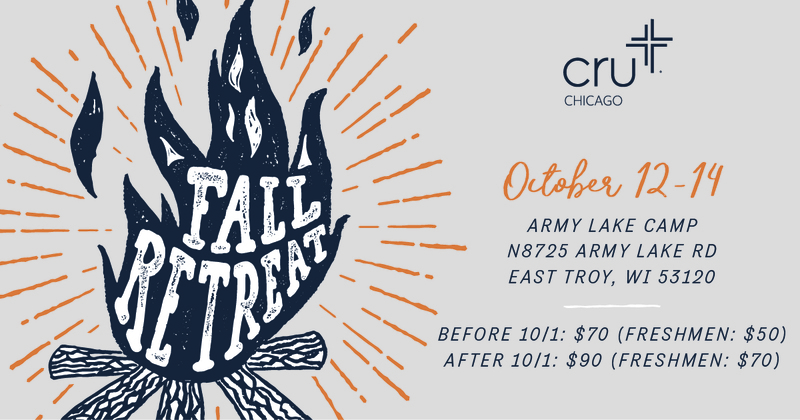 Join us for a weekend getaway in Wisconsin where you can connect with God, friends from your campus, and Cru students from around Chicagoland! Throughout the weekend we will be led into worship through music, studying the bible, and diving deep into community. Arrival & Registration: Registration will be from 5:30-7:45pm on Friday, October 12. We will be grilling hot dogs and burgers before the session. Be sure to bring extra food or eat before you arrive if you will need more food for dinner. There will be late-registration after the Friday night session if you arrive after 7:45. Departure: You are free to leave after 12pm on Sunday, October 14 when the morning session ends. Transportation – Army Lake Camp is about 100 miles northwest of Chicago. Those driving should plan on a 2.5 to 4 hour drive during heavy Friday traffic. For those without access to a car or ride to the retreat we are chartering a bus that will take students to and from the retreat. The bus will pick up and drop off near DePaul’s campus. The pick up time will be 4pm on Friday. The cost to ride the bus will be $15 to offset some of this cost (this will be a savings over previous years when students paid $10 for the shuttle plus the cost of Metra tickets). You can sign up to ride the bus on the online registration. There is no discount for only riding one way. Please contact Jeff Koch for more information about the bus. Saturday Afternoon – Fall Retreat Olympics, ultimate frisbee, Spikeball, slip n slide, and other sports/activities. 1. If I can’t come to the entire retreat can I come to part of it? What is the cost if I do that? 2. What should I bring to the retreat? 3. I have children, can they come to the retreat? Is childcare provided? At what cost? 4. What is covered in my registration costs? Your registration covers the entire program, two nights lodging at the camp, all three meals on Saturday and breakfast on Sunday. Breakfasts will be continental and not held in the dining hall. It does not cover any travel costs (if you are riding with someone you should pitch in for gas). In the past most students who drove stopped for dinner on the way there and lunch on the way back. 5. I’d love to go on the retreat, but I just don’t have the money to go, is there anything that can be done?